The U.S. Open is one of the most important events in tennis. It is one of four “grand slams” in a year-long competition of tournaments and it generates hype from even the most casual fans. Every major sports event draws attention on social media, especially on twitter where people are able to engage in a real-time conversation. 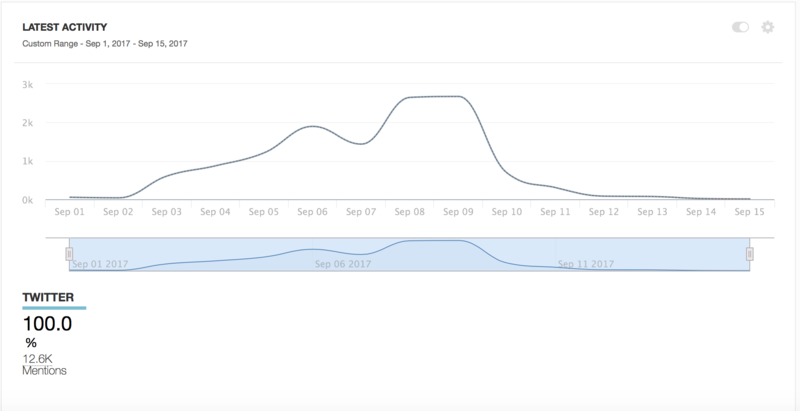 When analyzing the latest activity surrounding the US Open Finals, we found that the highest spike in twitter activity was on September 9th during the Women’s finals. The finals featured two Americans for the first time in a while. The men’s tournament on the 10th would typically create buzz, however this year there was an overmatched opponent leading to a very uneventful and noncompetitive game. 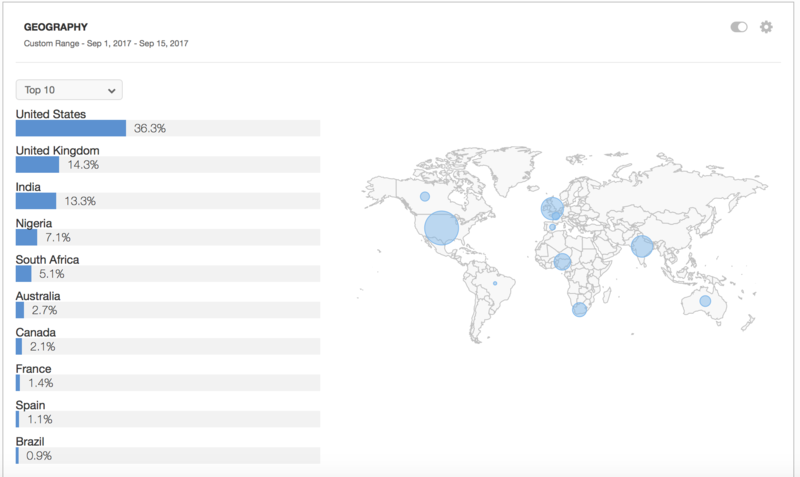 Geographically speaking, most of the buzz (36.3%) came from the US which would make sense given that it is the US Open Finals. This percentage also is likely due to the highest spike during the women’s final, which featured two American-born stars. The word cloud shows a clear visualization of the most prominent words during the conversation around the US Open finals. You can see that words like “semi-finals” and “madison_keys” and “@serenawilliams” were amongst many other related buzzwords. These words are bolded and larger since they were used more frequently. Smaller words are present to represent topics that are relevant and a part of the conversation that went on before, during and after the event. As we can see, Serena Williams, Madison Keys and Sloane Stephens were very relevant in terms of buzz. 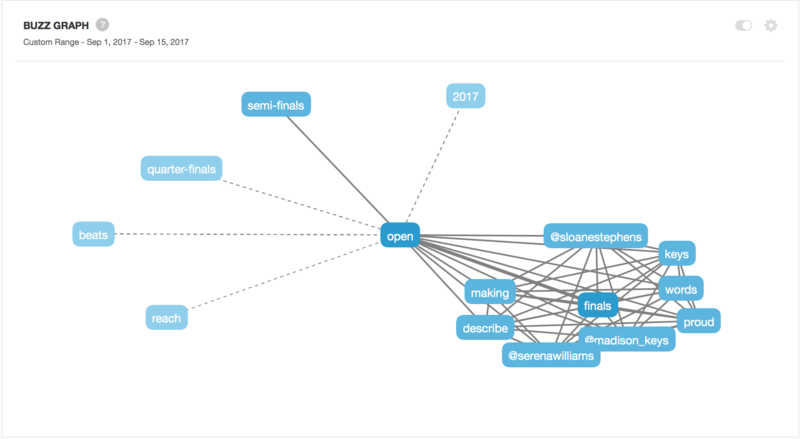 It is interesting to see that words such as “semi-finals” and “quarter-finals” are separated from words like “@serenawilliams,” “@madison_keys,” and “@sloanestephens.” This shows that there is a lot of conversation regarding what is going on in the game in real-time rather than just conversation about the event in general. Above is the most retweeted tweet with 3,382k. We would assume that this gained the most attention in the Twittersphere due to the fact that it is a huge Tennis star inserting herself into the conversation for everyone to see. Essentially Serena Williams becomes an influencer here, drawing in even more attention. Danielle Kravette, Ilyssa Rudman, Danny Fishbein, Remi Lubcher.